it is always best to CONTACT US First to see if we can ship to your country and get a Shipping Quote because International Shipping can be extremely expensive depending on the destination country, and weight of your products. All orders are packaged and shipped within 24-48 Business Hours. Most orders will go out the same day or the next day, as long as their are no issues with your payment. Please be sure to make sure your Correct Billing Address that is used matches whats on file with your Bank Credit to prevent shipping delays. This is the #1 Reason why an order is delayed. Once your order ships, you will automatically be notified by email, with your shipping tracking information. If you don't receive this within 48-72 hours, please check your Junk/Spam Folder, or CONTACT US Here for your tracking information. When calculating transit time, please be sure to factor 24-48 hours for processing time in addition to the shipping transit time it takes to reach your shipping destination. (Example: You order on Thursday evening, and your in NY. NY takes about 5 Business Days, so your expected delivery time from would be 5 + 1-2 Business Days for processing, so you would receive your order within 5 to 7 Business Days from the day you order.) If you also need a quick shipping transit quote you can CONTACT US Here and we would be happy to provide that for you. USPS FIRST CLASS Shipping - 4 - 7 Business Days to Most States in the USA. USPS PRIORITY MAIL Shipping - 2 - 5 Business Days to Most States in the USA. USPS EXPRESS MAIL Shipping - 1 - 3 Business Days to Most States in the USA. UPS GROUND/FEDEX HOME DELIVERY - 2 - 7 Business Days to Most States in the USA. View our UPS/FedEx Ground Shipping Map for Estimates to your State HERE! UPS 3-DAY/FEDEX EXPRESS SAVER - 3 Business Days to Most States in the USA. UPS 2-DAY/FEDEX 2-DAY - 2-3 Business Days to Most States in the USA. UPS OVERNIGHT/FEDEX OVERNIGHT - 1-2 Business Days to Most States in the USA. 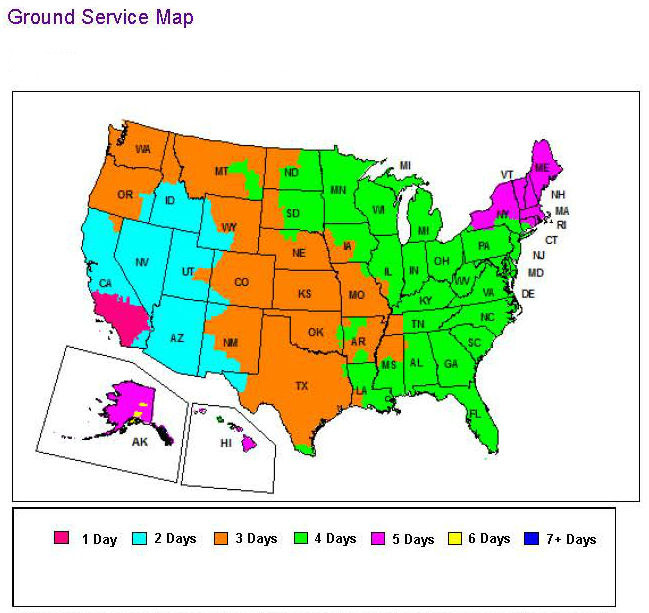 To View our UPS, FEDEX Ground Shipping Map Estimates, Please Click Here! Please Keep in mind when calculating Transit times that Business Days to not include Saturday and Sundays, and Processing time of your order needs to be added to the Transit time for accurate determination of expected ETA of Delivery Date. If you also need a quick shipping transit quote you can CONTACT US Here and we would be happy to provide that for you. Most of our items are in stock, unless it says otherwise on the Product Page. In the rare occasion an item is Out of Stock, we will attempt to notify by email, or possibly by phone, if by email we are unsuccessful. You can always send us an email through our CONTACT US page or through Live Chat to also Check stock on a product. your items in time you can CONTACT US and we will get back to you quickly about transit times. Most of our products are shipped from our California Wherehouse, but we have other wherehouses across the country that we also use from time to time to ship some of our lines of product. If you need a shipping transit quote for any of our products, please feel free to CONTACT US. Do you have Express or Overnight Shipping? Yes, we can use USPS Express 1-2 Shipping, or Fed or UPS Overnight. You might also be required to Sign for your Overnight Package, so please make sure someone is available at the shipping address to sign for he package. If you have any additional Questions about Express or Overnight Deliveries, Please Feel Free to CONTACT US Directly via Email or by Phone. BLINKEEZ.com only accepts Returns on defective merchandise. BLINKEEZ.com will not accept returns on "used" merchandise, "unsold" merchandise or merchandise that shows any signs of neglect or misuse. Any shortages or defects in the Merchandise must be reported to BLINKEEZ.com within seven (7) days of receipt of the Merchandise. Before Merchandise is sent back as a return or an exchange the Customer must contact BLINKEEZ.com and get a Return Authorization Number (RMA#). To contact BLINKEEZ.com regarding your return, please CONTACT US HERE and provide us with your Order #, Order Date, Full Order Billing Name, Product you wish to Return & Reason for Return, and we will get back to you within 24-48 Business Hours with your RMA# if Approved, and Return Instructions. Please make sure that all returns are sent back via an insured carrier. Make sure the package is insured for the value of the items you are shipping back. If the package is lost in route while being sent back to BLINKEEZ.com, it is the Customerâs responsibility to handle the insurance claim with carrier. For More Frequently Asked Shipping Questions, Please Check out our FAQ PAGE HERE!